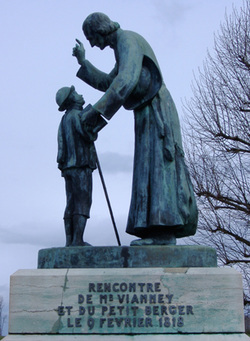 St John Vianney was born on May 8, 1786 near Lyons, France. He was the fourth of six children and spent his childhood and young adult life working the family farm. John grew up during the years of the French Revolution, a time of great persecution for Catholics. He realized from a very early age that to live one’s Catholic faith took much courage and heroism, and this only made his love for his faith stronger than ever. In 1803, at the age of 17, John felt God’s call in his life to the priesthood. Two years later he began to take formal instruction. He struggled with his studies, as he never had the opportunity to go to school growing up. However, his perseverance would pay off. On August 13, 1815, John was ordained a priest, and after a brief assignment as an assistant pastor, he was assigned to the small country parish of Ars in 1818. The church had been sacked by revolutionaries, and the parishioners were in dire need of spiritual guidance. Through a life of personal penance, clear common-sense homilies, and the revitalization of the sacrament of reconciliation, Fr. Vianney began to “right the ship.” On a typical day, he would hear confessions for 17 hours. He was everything a pastor should be, and he was faithful to his vocation to the very end. On August 4, 1859, Fr. Vianney died, having served at Ars for more than 41 years. He was beatified on January 8, 1905 and canonized on May 31, 1925 by Pius XI. Since then, he has been invoked as the patron saint of parish priests. You can download a CTS booklet about the saint's life from Ignatius Press website. "I love You, O my God, and my only desire is to love You until the last breath of my life. I want my heart to repeat it to You as often as I draw breath. "